A story of a band and their dream. A documentary from Deutsche Welle. 100 million recordings sold, 5,000 concerts in more than 80 countries and endless hits – the Scorpions from Hanover are one of the most successful rock bands in music history. The musicians announced that they would be ending it all in 2010, following a three-year tour. But things didn’t turn out that way! The documentary FOREVER AND A DAY tells the story of a band that just can’t stop living the dream. Director Katja von Garnier accompanied the five artists on their tour of the globe: the key locations in the film are Bangkok, Beirut, Berlin, Budapest, Moscow, Paris and L.A. At the same time, the documentary charts the history of the group, with archive footage of the most thrilling moments of the past five decades. FOREVER AND A DAY will be aired on DW in two parts starting on October 9. You can also watch the film here. The Scorpions’ huge world tour was planned as a farewell to their fans. It actually relaunched the famous German band’s career. FOREVER AND A DAY, a film co-produced by Deutsche Welle, shows how that happened. The documentary will be aired on DW in two parts on October 9 and 16 and will be available on dw.com afterwards. Stop while you’re ahead is an adage German rockers the Scorpions have taken to heart. After nearly half a century in the business, the five-man band from Hanover announced they would be embarking on a farewell tour in 2010. It was the perfect opportunity to send a film crew to catch the Scorpions’ last hurrah. Working for Deutsche Welle, the team accompanied the band on their tour around the world over the next few years. In the resulting documentary, FOREVER AND A DAY the rockers reflect on their unparalleled careers and let viewers in on a secret: They don’t really want to stop. In the film, lead singer Klaus Meine and guitarists Rudolf Schenker and Matthias Jabs recall their highlights from half a century on the road together, and film director Katja von Garnier weaves together entertaining anecdotes with historical film footage. Right from the start, Schenker makes it clear that success didn’t just fall into the Scorpions’ laps. It all came down to discipline and determination. The five-some set their sights high – despite resistance from advisors, labels and promoters, and managed to play their way through Germany, then Europe and Asia – ultimately landing as headliners at top American festivals. Every success story is strewn with setbacks, and the Scorpions are no exception. In 1981, for example, Klaus Meine lost his voice when they were recording the album “Blackout.” For the next 10 months, it wasn’t clear whether he would be able to sing again and even considered throwing in the towel. But Rudolf Schenker kept the group together and Meine went through a complicated vocal chord therapy. Hardly a decade later, the Scorpions released their biggest hit of all time, “Wind of Change,” which would become the anthem of German reunification. Nevertheless, the 90s were not a particularly successful decade for the group, but things picked up again in the 00s with live gigs and a broadening fan base outside of Germany. At home, the band was often belittled as macho hard rockers, though their image in Germany has improved over the past two decades. With things going so well, why do the Scorpions want to bow out now? You’ll have to watch FOREVER AND A DAY to find the full answer. But one thing is clear: Their lives on the road have come with a personal price. One particularly moving moment in the documentary is a drive through Paris in a limousine. Klaus Meine and his wife Gabi talk about how challenging it can be to harmonize a private life with a high-powered music career. Even though the singer had a secure home life for years, he painfully feels the consequences of his career choice. “Gabi is right when she says, ‘Now we can do something nice together, but you left your energy on the street and I only get the leftovers,'” says the rocker. While the disappointment can be felt, the couple also seem to have a deep sense of understanding for each other. The plans for their grand finale included their 17th studio album, “Sting in the Tail,” and a three-year world tour. The album became one of the bands most successful; the farewell tour was a triumph. They couldn’t stay away for long. 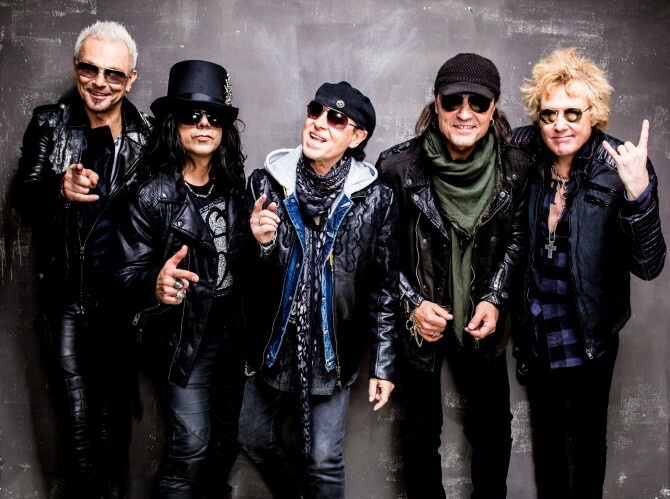 In 2013, the Scorpions announced their comeback. In the summer of that year, the group performed two acoustic sets in the Lycabettus theater in Athens. That performance resulted in “Scorpions – MTV Unplugged,” and was swiftly followed by a tour of Germany. In February 2015, to celebrate their 50th anniversary, the band released a new album titled “Return To Forever.” The Scorpions kept on performing on the world’s biggest stages throughout 2016. Their “2016 World Tour” started in September. The Scorpions are one of the most successful rock bands ever. This year marks their unbelievable 50th stage anniversary. During their “Farewell Tour” they decided that they want to just keep on rocking. The documentary FOREVER AND A DAY which is co-produced by Deutsche Welle traces the band’s unique history. Here is a report on the world premiere of the film in Berlin. Just before 10:30 p.m., standing ovations greeted Scorpions in Theater 3 of the Kulturbrauerei (Culture Brewery) in Berlin. Saluting the decades-old style of the hard rockers from Hanover, many of the 600 visitors donned black leather with silver rivets. Scorpions have their loyal fan base, for whom being there for the premiere of the band’s first feature-length film was a must. In 100 minutes, viewers get an inside look at the band’s dynamics and the musicians’ feelings. Over the course of the movie, the band members have a growing trust in the film makers and are rewarded for their honesty. Warm applause at the scene where it becomes clear that front man Klaus Meine has one of the few happy marriages in the rock business. The 66-year-old singer has been wed to his wife Gabi since 1977. It’s a story about music and friendship instead, with the band’s secret of success being decades of mutual loyalty on the part of its members. The premiere audience was enthused: “The film is a salute to the band’s lifetime achievement,” said Marcel Schleiff, filmmaker and hardrock expert. Most impressive, he felt, were the Super 8 films from the band’s archive, never shown before. But first, it’s time for all the participants to collect their accolades. At every juncture of the 2015 world tour, the film will be shown in local movie theaters. With the premiere of “Forever and a Day,” Scorpions’ anniversary year got off to a ceremonious start.